It seems that every job requires you to have experience, and if you already have experience then it’s not enough. For those out there who are coming up to the end of their time at University the world of work can be a daunting one. Especially as every job application now seems to have the word experience plastered all over it. Or even better, when you hear back from a company who tell you they won’t be employing you as they have had applications from people with more experience. And if you are looking to change jobs, it can be as difficult to find a job, especially if you don’t want to start at the bottom again and work your way up. Get an internship in the field that you wish to work in, ideally in the exact job role that you wish to work in. An internship will allow you to perfect your skills in the industry and will get you used to what is required of you in the job. It may give you the opportunity to learn the tricks of the trade and will look great on your CV. The employer may be able to act as a reference in future or advise on current jobs openings. This way you don’t have any gaps in your CV as you are working as an intern. Employers are always keen to see people who work for free as it shows an enthusiasm for the job. Charity work can vary from volunteering in a shop to fundraising. Some of these jobs can come with a salary, but if you are volunteering you are working for free. Working for a charity shows that you have interests, it shows that you are selfless, that you want to make a difference and that you care about certain causes. It gives an employer a better idea of the kind of person that you are. It shows that you are willing to give up your time to help those in need. This is particularly good to do if it also helps you to develop your skills or learn new ones. Self-promote by using Twitter, LinkedIn and even your own blog to show case your skills. If you don’t have an account on these social media pages then set one up. And definitely make sure you look into setting up a blog. Get a Twitter account and begin to tweet your skills and interact with the company you want to work for. Start by sending the company ideas, post relevant news articles to them and anything else you can think of that might interest them. Add the company directors and employees on LinkedIn, post interesting things to catch their eye, join their groups and be an integral part of discussions; be interesting. On your blog you should write about the industry or job you wish to get into to show how much you know about it. Always bring something new to the discussion. Research how others got into the industry. The likes of Richard Branson, Alan Sugar and Bill Gates are always happy to tell everyone how they started their businesses. The internet proves to be a gold mine for research. Have a read about how other people got into the kind of job you want, they might prove to have some new ideas that you haven’t thought of yet. Ask for advice from those in the industry. If you have been turned down for a job why not contact the company and ask for some feedback? Be proactive. This will show that you are keen to improve and are serious about the job. If you want to become a teacher for example then ask a teacher how they got their job or what schools look for in a new teacher. These people are the best to ask because they are working in the industry and they know what is required of newcomers. Who better to ask than someone who has been through the same thing? Identify your skills and how they are transferable. This is particularly key if you are looking to change industry. Any skill you have can be used in a different role, it’s usually just a case of knowing how to change it to your advantage. Use these skills to your advantage, show an employer how you think differently because of these skills and how this makes you an asset to their company. They might not have realised that they needed a person with these skills in their company, but there you are! Make sure your CV is a shining example of perfection. Spending a good few hours working on your CV could make all the difference, after all it is the first thing an employer will see. If a potential employer does not like your CV you might not get an interview or a second chance. If you know you are really great with interviews and give a great first impression face to face then your CV could be cutting you short before you get the opportunity to shine. 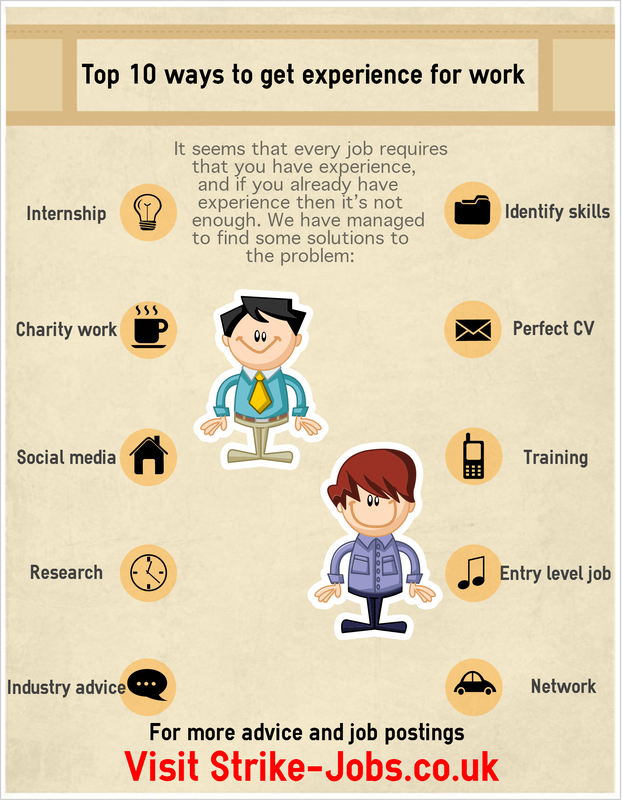 Try tweaking your CV yourself or ask friends and family, or teachers or class mates for help. If you don’t want to ask for help there are plenty of templates and hints and tips online. If one qualification is holding you back then go out and get it. Sometimes we lose sight of the real goal and we get lazy. Don’t let this happen. Getting an extra qualification doesn’t have to be hard work or time consuming, it’s all about the attitude you approach it with. If you have a gap in your CV and an employer sees that you have gone back to education then this can only be seen as a positive thing; it shows that you are determined to pursue a certain career. If you are looking at a managerial position or something higher than entry level then maybe think of aiming lower. As disappointing as it may seem it will show you are willing to work hard for your goal and you will be able to work your way up. Get to know the important people in the company. Usually you’ll have a friend of a friend who knows someone who works in the company that you want to be a part of. Get yourself invited to the staff parties as a plus one, or look out for fundraising days put on by the company. Just turn up where you know they’ll be and introduce yourself. They’ll admire your tenacity. This entry was posted in Top 10 Jobs and tagged 10, advice, advise, blog, charity, charity work, cv, experience, facebook, free, industry, intern, internship, linkedin, media, network, qualifications, research, skills, social, social media, ten, top, Top 10, top ten, training, twitter, work, work experience. Bookmark the permalink.